One of the erasers that I have been using recently is the pentel clic eraser. Generally as I use it just for cleaning up writing. Also due to it's shape it's reasonably easy to carry around. Also comes with a reasonably effective clip. It's effective and the waste is as you describe eloquently twisted strands. Any thoughts on the Faber Castell Vinyl Eraser? Well at the start of the year I had another bout of insanity and thought it might be a good idea to collect erasers made by the mechanical pencil companies. Luckily this minor side-obsession didn’t last too long, and erasers are cheap, so I didn’t spend too much money. So anyway, I’ve got the Faber-Castell erasers but haven’t used them. I’ve got a few posts on stick erasers in the pipeline. I’ll get the FC erasers out and see what I think about them, but it’ll be a few months before I get a chance to post anything. Alternatively, feel free to become the first guest reviewer of erasers. I grew up using the Staedtler (526 50 and their stick version) and Pentel Clic erasers. Both erasers are competent although the Pentel Clic just seems to erase better than the Staedtler stick. The mechanism is also way more convenient. Where I grew up, I don't recall seeing a regular Pentel eraser (the Clic was very popular in my locale) although they are plentiful where I live now. I started using the Faber Castell Dust Free eraser (18 71 20) about a year ago and I find that it works better than the other two. 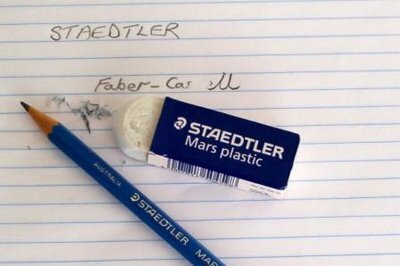 The eraser itself feels softer and less "solid" than the Staedtler. When I lightly rub the erasers (no wisecracks please), I find the Faber Castell liberates eraser more easily. I don't seem to need to put as much force into getting the eraser to do its job. Also, the Faber Castell has the interesting behaviour of erasing almost to a flat surface when you erase at the same angle for a prolonged period while the Staedtler always stays rounded no matter how long you erase at the same angle. The shavings roll together much easier than the Staedtler or Pentel erasers especially when erasing large tracts. I generally use a Pentel Clic when erasing a word or two (better precision) and the Faber Castell when erasing a bunch of words or lines. I'll have to buy a few of the regular Pentel erasers and do a comparison. Also note that the Clic eraser now comes in two versions: with and without a rubber grip. The gripless version ZE21 is still listed on Pentel's website but you'll be darned to find one in the shops. The ZE22 with grip is all I can find in the shops. I hate the grip on the ZE22. It is a dust magnet and always looks shabby. That's a pity about the pentel clic aquiring a rubber grip. I too like you have found that anything with a rubber grip seems to attract dirt and ends up looking mucky real quick. Thankfully a while back I aquired a bunch of the ZE21's but unforutnately there red and not the blue or black I like. Well I still suppose that they're better than the ZE22. I'll have a look in one or two of the office supply stores here and let you know what I find. Hey, how 'bout the "Magic Rub" eraser? It erases extremely well: no smudging and no annoying cardboard sleeve to get trashed up! I've not heard of the Magic Rub eraser. Can you you point me to a website detailing it? Magic Rub erasers are widely available in the U.S.A.
Dave, do you know if these erasers harden with age? Here in the USA we can only seem to get these Mars Plastic Erasers in packs of 4, and I wonder if they'll harden while I use one and keep the rest away..
Let me rephrase that question, if I may...do you know if this eraser hardens, deteriorates or degrades with age..and if so what time spans are we looking at ? I have Staedtler erasers from high school (almost 20 years old) that erase as good as new. Well I can't compete with Wilson on that one! I guess being PVC they must have some sort of life span, but its obviously pretty long. I've found some in the back of desk drawers etc that must be many years old and they still seem OK. Thanks Wilson and Dave ! Has anyone seen the Stabilo "Exam Grade" eraser --- it is black! Never seen a black eraser in my life -- bought two! I'm a huge fan of this eraser. Here's a tip to help with those tatty ends. Simply cut a small insision on the sides and also cut some of the end off (if needed). Then fold the ends in, glue of sticky tape them together and tada! you have not only protected the bottom of the eraser, the tattiness of the cover is significantly decreased!Just snip a bit off the top of the cover as the eraser gets smaller. I am a pencil collcecor myself. For many years, I have looked for a really good eraser that was better than all others. I have now found it. I just went to a local office supply store and piced up a 4-pack of the erasers. They are awesome!! I have finally found "that" eraser. Thanks for all the work you do and may God Bless you!! These used to be available in other colors (I have one in black plastic & white plastic). I like them because the feed mechanism ratchets & locks, so the eraser doesn't slide around. The compound is nice too. Hi Andrew - the answer is maybe. Contact me direct on the email address in the blog hearder. Yep, just replace the ATs and DOTs. Sorry Ihavenent e-mailed u in a while ive had a lot to do. Maybe in a while when I get some free time! I was wondering if you had ever tried the steadler Rasoplast eraser. I have seen it and I would like to know what the difference is between this one and the Mars Plastic. BTW, I was in taiwan all summer, but I live in Quebec City, Canada. 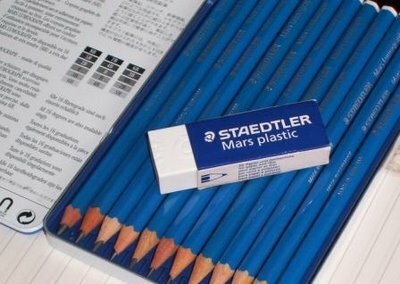 Well Staedtler's website implies Mars is the good stuff, and Rasoplast the ordinary quality. I have thus far resisted actually testing them myself, but give me a few weeks and I might just get around to it. OK, I understand the Taiwan reference. I`ve used an eraser called sakura foam eraser and it is the best eraser I have seen. Don't know, but I think light blue sleeve is old, dark blue new. "Of course down here it’s still often called a rubber." Does anyone know why they call it "Mars"? 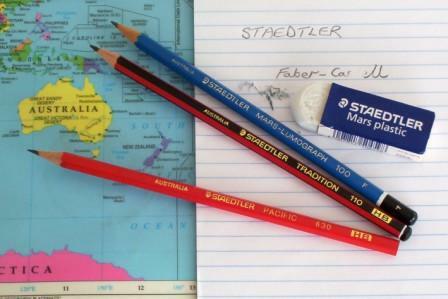 The Staedtler logo is the head of Mars, Roman God of War. 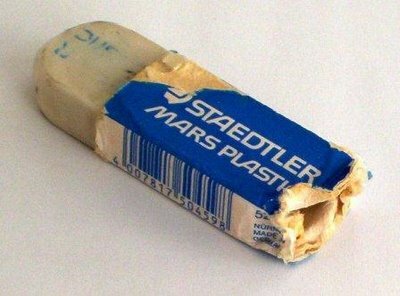 I would always go in with the Mars plastic. But then i recently discovered Steadtler Triangular eraser. I found that it had a better erasing power than the mars plastic but it produced finer dust ( lots of them actually). If you could try it, it would just too good!! I bought this eraser 2 days ago, for the first time, it's the best I've seen so far!! But unfortunately it's not available everywhere... only on 2 store in my city (in Brazil). And it's kind of expensive. That's why I like eBay. Brazilian erasers are nice too, and extremely cheap, but not as nice as Mars. Kiwi, I guess that an eraser you reviewed (half blue and half red) is Brazilian. The model is 'BR', isn't it? I used this kind of eraser when I was a child, and it is still somewhat popular here. I didn't know the blue side was to erase pen ink. Nice blog, please keep reviewing nice products! I like the Faber Castell Vinyl eraser. For me, it is more effective and less aggressive with the paper than the Staedtler Mars plastic. My favourite eraser, too. Reliable, cheap, available everywhere--it just can't be beat! It's possible to keep a sharp point without cutting the rubber, and to keep the sleeve neat. I cut the sleeve about 4mm from the bottom, this leaves a sharp point for detailed erasing (so long as you use the other end for heavier erasing) and means that the sleeve doesn't scuff up. Pentel Tuff Stuff is great for erasing tiny areas. My favorite erasers for erasing small areas are the Pentel Tuff Stuff eraser stick (3.8mm diameter eraser) and the Tombow Mono Zero elastomer eraser (2.3mm diameter diameter eraser). Both have long lasting erasers housed in click-to-advance, pen style tubes with shirt pocket clips. Highly recommended for graphite artists! I see that you can now buy Mars Plastic erasers in stick format, similar to the ubiquitous Pentel Click eraser. Anybody tried them yet?